This is so sweet! 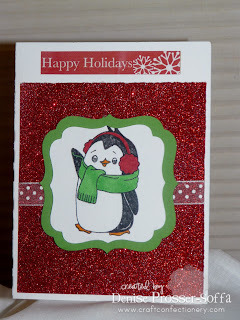 Love the penguin and the red glitter background! Adorable card!! I love the little penguin, it's so cute. Thanks so much for sharing. Cutest little penguin card...look at him waving! So stinkin' cute!!! oh so glittery and nice! love it! What a cute penguin. My family is just crazy about them. Darling penguin, he really pops on the sparkly red background. I'm already a follower. This little penguin is sooo cute!!! Love your card!! that penguin is so cute! and the glitter paper looks so pretty! Love this penguin with the red shimmery background paper.